I graduated from Barton Secondary School in 1990, went on to receive a BA in Sociology from McMaster University, and completed studies in social service work and police studies at Sheridan College. I then attended the RCMP training academy and was hired by the Force. As my policing career was beginning I was able to continue my studies with certification in forensic sciences, intelligence analysis, and human resources management from BCIT and SIAST. In 2011, I received a Master’s degree in Criminal Justice from University of the Fraser Valley, and currently I am continuing studies in adult education and training at the University of Regina. Today, I am an RCMP officer. After working in four different postings in BC in nine years, I have just completed over seven years as an instructor/facilitator at the RCMP’s national training academy in Regina, SK. Here I was a primary instructor in applied police sciences, firearms, and use of force. 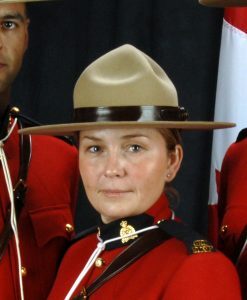 In fall 2013, I will be transferring to Surrey, BC – the largest RCMP detachment in Canada – to assume a ‘Training NCO’ position. The bursary helped me to balance attending McMaster and Sheridan with working and being a single mother. Without various sources of assistance, I could not have completed my programs that prepared me for my role as a peace officer. If I could say anything to the two sisters, I would say thank you – everyone has a story that includes personal challenges and hurdles, as well as goals and dreams. Without donors to support award programs such as this, many deserving and suitable candidates would not be able to rise to their full potential.